Expertise your farm legend skills in this fruit splash game. Fruit Splash: Farm Legend is an entertaining fruit match 3 game of juicy fruit splash. It is a delicious fruit match 3 game in which you can create juicy fruit combinations. 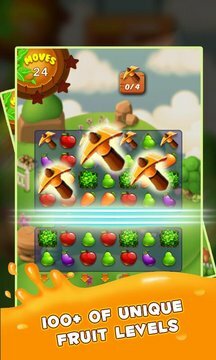 Enjoy all the juicy fruit puzzle game with mouth watering fruits in this juicy fruit adventure journey. Swap fruits and create match 3 combinations and make perfect fruit splash. Are you ready to play this fruit puzzle game and become Fruit legend? Then lets catch em all the fruits. 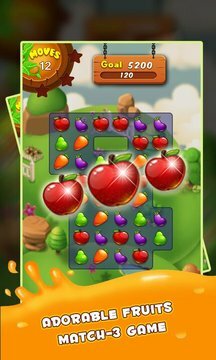 • Unique and delicious fruit set with fruit pop and juicy fruits in each levels brings you tons of sweet challenges. • 100 + uniquely designed farmoholic puzzle levels. • Elegant game design and rich graphics. • Collect all the fruits to win the level and remove all the hurdles. • Explore juicy land, mouth watering islands and delicious ice land. • Treat yourself with all the amazing candy fruits and clear the obstacles.